You can use AFerry to book ferries between the Philippines islands, including Cebu City, Cagayan De Oro, Manila, Bacolod City, Tagbilaran City and Zamboanga City. Using AFerry you will always get a great deal on your ferry in the Philippines. See below for timetables and the latest special offers. Booking a ferry in the Philippines couldn't be easier with AFerry. You can either use the booking form at the top left of the page. Or, if you see a price you like on this page, just select the number of passengers and clickgo. The Philippines, officially known as the Republic of the Philippines, consist of a number of islands located in the western Pacific in Southeast Asia. Altogether there are over 7,100 islands! Most of these are uninhabited as they are too small. The Philippines is know for its beauty. With gorgeous white sandy beaches, crystal clear blue sea and one of the world's greatest biodiversity, it could be described as a paradise. However, due to it's location the islands are prone to typhoons. For the best weather it is recommended to visit during November - March, for the best chances of hot sunny weather. 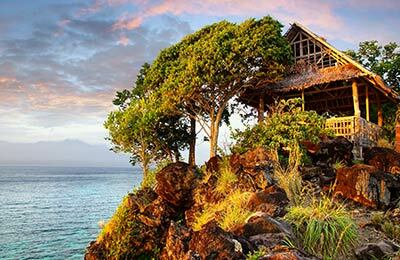 If you want gorgeous scenery, isolation and a proud cultural heritage, the Philippines is the place for you. It would take 20 years to spend a day on each island in the Philippines. 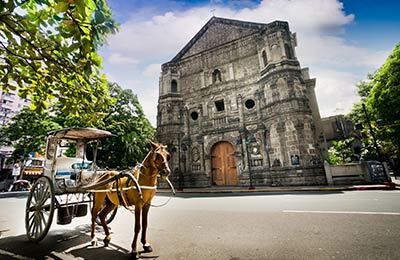 While most of us unfortunately don't have the time to do that, we can explore more of the Philippines and its heritage by moving from island to island. If you do choose to island hop (and you definitely should), then ferries are the best method of travel. You'll find information on the ferries available between the islands on this page. Train services in the Philippines are developing and are the most comfortable way to get around on land, with sleeper services available, allowing you to make the most of your hours in the daytime. Buses are the cheapest way to get around within the major islands. Scheduled trips are available from Manila to provinces to the north and south. The Philippines is home to several UNESCO World Heritage Sites including the spectacular Banaue Rice terraces, The Baroque Churches and the Tubbataha Reef National Marine Park. The Philippines is a spectacular place to learn scuba diving, with a great variety of dive sites - most of which have PADI-accredited diving schools. The costs of scuba diving in the Philippines are comparitively cheaper than places like Australia and Thailand. The archipelago of the Philippines has unique cave systems which are great fun to explore, some of which involve swimming to get through the tour! Wherever you go in the Philippines, you are bound to have an amazing experience safe in the knowledge you got a great deal with AFerry.